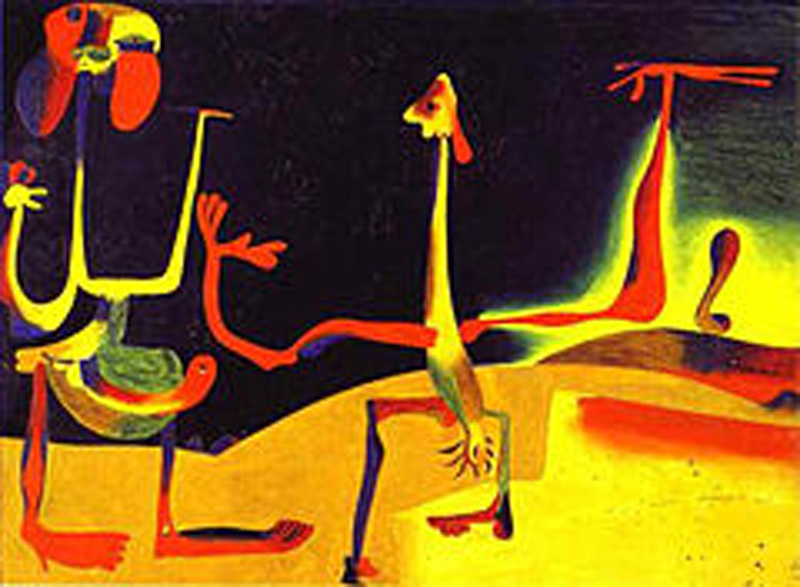 Great work can open your eyes, and Joan Miró’s Man and Woman in Front of Pile of Excrement opened mine to modern art. I first saw the painting in Scotland in 1980 when I was 14 years old. I remember laying eyes on it and feeling the room shift. Artistically, this small painting on copper was tantamount to a new pair of glasses. It was the visual equivalent of someone smacking me on the face and saying, “Snap out of it!” or my first great kiss. I engaged the world differently after experiencing it. I saw myself in the world differently. I was visiting my Scottish Grandmother at the time, and she was horrified at my fascination with this work. I couldn’t stop looking at it. It was like looking into my own reflection, at times beautiful, subversive, rude, familiar and yet grotesque. It encapsulated the way I felt at 14. I know now that the painting was one of twelve “Wild Paintings” that were Miró’s response to the tragedy of the Spanish Civil war. I knew none of that then. I just knew that this picture moved me. I left changed on exiting the gallery after seeing it. I saw the painting again just recently while visiting the Fundació Joan Miró in Barcelona. I turned a corner and there it was, suddenly, like a treasured mentor I hadn’t seen in decades and I wept. 36 years had passed since I had first seen that painting but I could still feel the way it moved me when I first looked upon it. Like opening a box of long lost journals it reminded me of the power of freshly seeing. The sensation of blinking until the world comes into focus. The power of looking. My world, indeed the entire world, is much different now than it was almost 4 decades ago. But the power of seeing never changes, and looking, really looking can change the way we see. This is a great post David. I’m impressed that at 14 you were so engaged in a painting – you were born to be an artist! Hello dear David. So very beautifully written. I just read your post aloud to Rob… I greatly appreciate your sensitivity and interpretation into masterful words. We are surrounded by Deco jewelry…shipping to a big production. We waved at you in palm Springs last Thursday as we drove home from LA…and a very successful trip, I am happy to report. All in all it has been a significant week for me!!!! hurrah. i am still blown away by the award. It is a huge deal here in Tucson/Pima County. I am so humbled and honored….and feel seen. Rob is talking about experiencing art for the first time in Europe at 18…from Greece to Italy to Germany. He recoignized motifs from Greece…this was all before having studied, but his impressions were poignant and clarifying. It made hime want to study art. Thanks for the beautiful words, Catherine. Tell Rob I just recently saw Keinholz’ Barney’s Beanery. It’s an extraordinary work. Sorry to have missed you coming through town, but I completely understand. And congratulations on your award! I let out a yelp when I read your news. Well deserved.